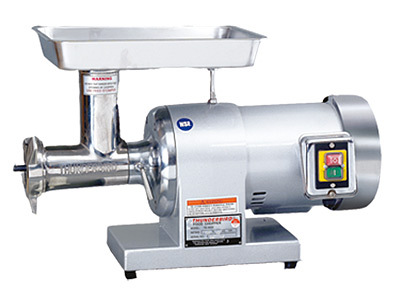 1 Hp electric meat grinder. Stainless steel head, worm, and knife. Grinds 8-12 lbs of meat on first grind through 3/16" plate. Several different hole size plates available. Comes with sausage stuffing attachment. Grease packed, no oil changing needed. Standard #12 head. Machine weight: 60 lbs. UL approved. Painted Body. Capacity: 8-12 lbs/minute. Standard Equipment: 2 Plates (4.5 & 6mm) and 2 knifes stomper, sausage tube.